Sweratel Cloud management solution offers flexible, secured and user-friendly Network Management Services for the customers to manage their RTWIP wireless network remotely and globally where making the deployment of the RTWIP Wireless Network to be relatively effective and simple. 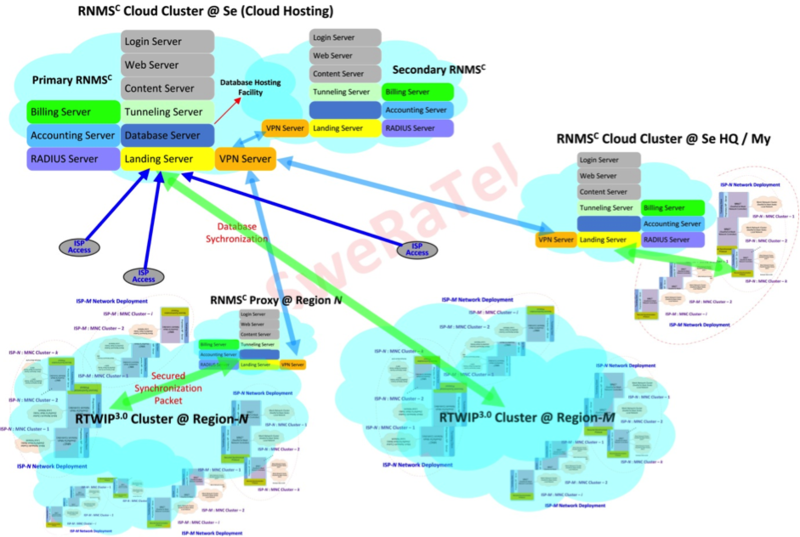 Sweratel Cloud Management (SCM) Solution and System offer all the compliance standard networking management features that one would expect from traditional systems but delivered in a multi-tenant cloud based model that is simple to use for the network owner/subscribers or IT administrators. SCM offers enhance flexibility in management, monitoring & control anytime anywhere, where not possible with legacy networking solutions and with no capital investment. Global access for System (deployed network) Diagnostic and Events Driven Alarm & Alert as well as system Performance Analysis and Pre-emptive Maintenance. The following diagram illustrates the global operational topology of Sweratel RTWIPC Wireless Network deployment with global cloud access via any potential internet connection. In general, RTWIP Cloud cluster could be deployed anywhere globally, where the fundamental system elements comprises MNCC (Managed Network Controller) and the respective cluster Base-station (Access “Node” with Gateway and/or Relay function). The MNCC would then automatically established a Management tunnel back to RNMSC where enabling the cloud management services and authentication/accounting via centralized CBS system. ISPs or Network providers could then remotely or globally managed and configure their respective Network operation including end-user/client management via the Cloud Based RNMSC Management Server and respective CBS (Convergent Billing Suite) Server. In parallel, the end-user/client of the respective ISPs or Network Providers could also gain access to the Cloud Based management suite to view and monitor their respective accounting system and billing information, anywhere and anytime, where including billing settlement via potential enabled payment gateway. Sweratel Cloud Management Servers are hosted with advanced Cloud Hosting Services, provides 24 x 7 with 99.99% up-time performance, where virtually accessible anywhere and anytime. Sweratel Cloud servers are designed with high and dynamic scalability where having redundant components built into the servers in order to deliver the highest availability.